Europäische Meridiane - Neue Musik Territorien. Reportagen aus Ländern im Umbruch. 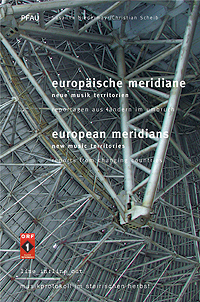 European Meridians - New Music Territories. Reports from Changing Countries. Based on radio specials Next Door - A Survey of Austria's Neighbours (nebenan - Erkundungen in Österreichs Nachbarschaft) and the ensuing reports in the Ö1 programme Zeit-Ton, this box set with two books and two CDs offers a present-day and vibrant view of the musical changes of the most varied nature, from Estonia to Serbia-Montenegro, from Poland to Rumania. "An Eastern Europe does not exist", was how the editors and journalists Susanna Niedermayr and Christian Scheib summed up their experiences after they had visited twelve countries to do research on current musics, from unconventional club sounds to elaborate string quartets, only to discover that these scenes abounded everywhere. Three years later, they are presenting the rich essence of their observations, produced by the Vienna-based cultural platform line_in:line_out and the ORF festival musikprotokoll im steirischen herbst, and published by PFAU, Saarbrücken. While politicians were struggling to reach an agreement on how and when a particular country of the former East Bloc could become part of the European Union, Susanna Niedermayr and Christian Scheib were exploring the rich and varied music communities in several of these countries. From 2001 to 2003, these investigations were followed by a number of features for magazines or the radio, and by concert series or special programmes for festivals, from musikprotokoll 02 to Wien Modern 2003. Live recordings of parts of these festivals can be heard on both CDs. On the one hand, this project was, and is, aimed at intensifying contacts between musicians and organisers from different countries, as well as musicians from different scenes. On the other, the authors want to give an account of the changes that took place during the last ten to fifteen years and, through close observation and portrayal of the interconnection between music, politics and society, depict these changes in a new light. The interdependence of political reality and artistic creation is obvious in countries where, almost without exception, new governments superseded socialist-realist totalitarian systems some 15 years ago, albeit in different ways. From an expedition into unknown territories to an open forum for the exchange of ideas: the titles of the books are a reflection of the process that this project underwent over the course of a couple of months. Whereas Volume One was entitled In the East, the entire box set was given the more receptive name European Meridians. CD 1: Eclectic improvisation between Hammond organ sounds, noise and minimalism from Bratislava - Vapori del Cuore; structured and filtered field recordings as subtle ambient music from Warsaw - Viön & Mem; the delicate compositional appreciation of only a few instrumental sound and tone combinations from Bulgaria - Dragomir Yossifov; free improvisation in the emphatic sense of the word from Budapest, with a guest from Austria - Abstract Monarchy Trio; new electronica between beats and noises from Zagreb - Jeanne Fremaux; broken dancefloor with semi-ironical vernacular roots from Sofia - Tkrst. CD2: Belgradeyard Sound System explore new territories of a laid-back intensity, mapped out by the cool pulses of a double bass and, as a counterpoint, the ghostly squeaks and squawks of electronics. Marko Ivanovic from Prague experiments with banalities, splendid extravaganzas and the rock or blues sound bordering on irony that is so characteristic of Agon. Error from Latvia, in his turn, dives into an ocean of melancholy electronica. "You never know whether the obsessions are good or evil," the Romanian composer Irinel Anghel comments on the sparse sound figures in her new Surrealism, which recur like a dream, or is it perhaps a nightmare? Last but not least Wojt3k Kucharczyk presents a snappy as well as subtle showcase of the peculiar music projects he has linked up on mik.musik. !., his small independent label and artistic platform. Translation: Friederike Kulcsar, John Wojtowicz (report from Poland) and Kimi Lum (report from Czech Republic). Produced with the support of Erste Bank Austria, City of Vienna, KulturKontakt Austria, platform culture central europe of the Ministry of Foreign Affairs, and Wien Modern. line_in:line_out was founded by Susanna Niedermayr. It is a platform for realizing intercultural projects. line_in:line_out cooperates with different institutions and structures of the cultural scene - centers, festivals, labels. Contents are exchanged. Contacts are established or stimulated, especially between scenes and genres not knowing each other too well. In the moment line_in:line_out is concentrated on exchange with musicians and artists from Eastern Europe.